Click the chart to track shares of BlackBerry. 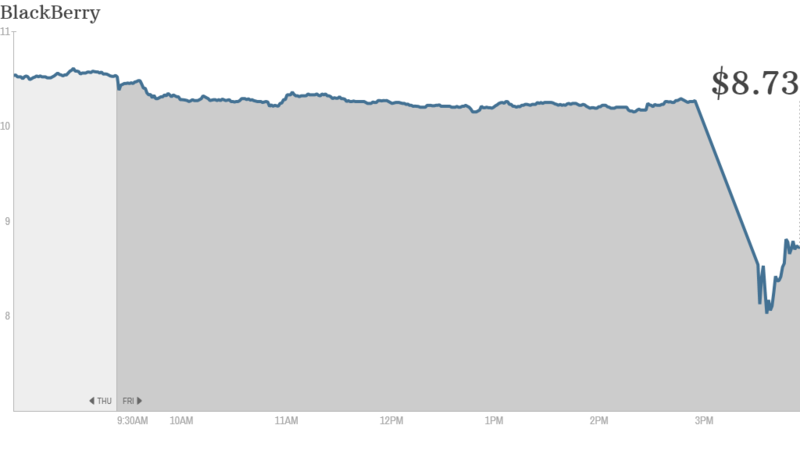 Shares of BlackBerry (BBRY) were halted at about 3:30 p.m. ET and plunged 20% when trading resumed. For the day they closed down 17%. BlackBerry's stock is down 26.5% this year. The news of 4,500 job cuts came late Friday afternoon, confirming layoff rumors that have been swirling about problems at the smartphone maker. It attributed the loss to a charge it will take to restructure its business as well as an "increasingly competitive business environment." The anticipated operating loss is about three times larger than the consensus forecast of analysts. The company is due to report financial results on September 27. "We expected bad results but the device sales are pretty bad," said James Moorman, analyst with S&P Capital IQ. "I like their strategy of cutting back, but it's kind of late. This should have been done about a year ago." Neeraj Monga, analyst with Veritas Investment Research, says that BlackBerry made a stunning admission about the lack of demand for its new BlackBerry 10 upon which it has placed so much hope. Normally companies book revenue when they ship products to retailers but Friday's statement said it will instead wait to book revenue from those phones until they're sold to customers. "It's a bigger flop than anybody thought it could be," he said. "They expect 80% (of shipped phones) to come back." The company reported last month that it is exploring ways to keep itself afloat -- including a possible sale of the company. Moorman said the constant drumbeat of bad news is scaring away potential customers, and added that taking the company private would be the best course of action. "Now with the stock taking a hit, that's more attractive," he said. "Going private takes you out of the spotlight. When you're on CNBC every day talking about a death spiral, that's not good. It becomes a self-fulfilling prophesy if you stay public." There have been rumors that Toronto-based investment firm Fairfax Financial Holdings (FRFHF) might be interested in taking the company private. It's already Blackberry's largest shareholder, with nearly a 10% stake. But Monga said he thinks that time is running out for BlackBerry. "I do not believe this business can be turned around. I don't think an acquisition is in the offering. This suggests the end is coming pretty soon," he said. Experts predict that BlackBerry would have a tough time finding a buyer for the entire company, since no suitor is likely to be interested in its hardware business. But BlackBerry does possess some lucrative patents that could be attractive to a potential buyer or partner. That's a massive advantage in the competitive and highly litigious world of smartphones, and it could be attractive to a big rival like Microsoft (MSFT), Apple (AAPL) or Samsung. At least BlackBerry has some breathing room: The company has $2.6 billion in cash. But that's down about $500 million from the previous quarter, a cash burn rate that Moorman described as "shocking." If BlackBerry's smartphones themselves are a deal-killer, peeling off the company's software business could help gain interest from a number of buyers. BlackBerry's brand has lost consumer cachet, but it still holds a strong reputation for corporate security. - Julianne Pepitone contributed to this report.